If there’s a pole in North Pole, that pole is striped like a candy cane. 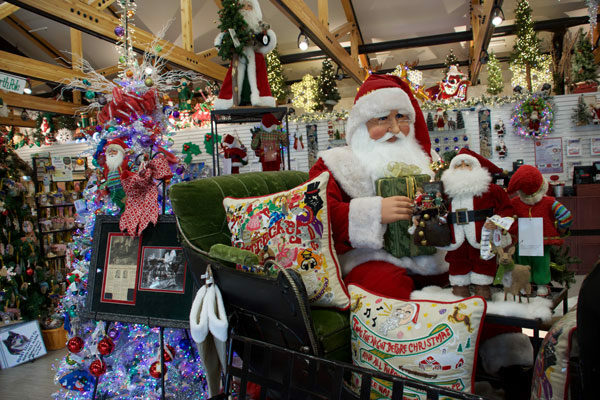 A look at just a fraction of the decorations and gifts available at Santa Claus House. 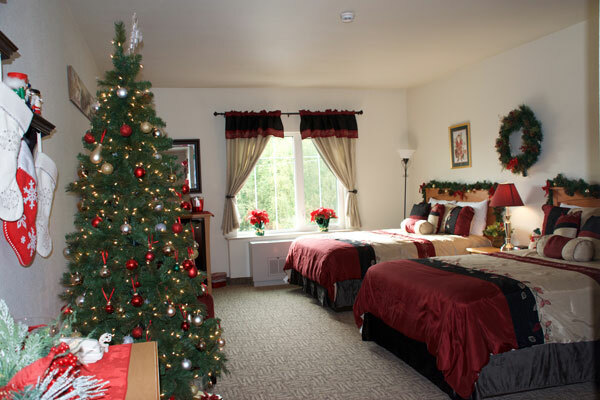 Visitors to this charming community can stay at the Hotel North Pole, which besides being a well-appointed inn offers a very unique accommodation: The Santa Room. Here your child—or anyone of any age with a Christmas obsession—can overnight in a room beautifully decorated for the season. Expect a visit from Santa, who will read “The Night Before Christmas” aloud to guests over milk and cookies. The hotel’s general manager, Wanda Adlesperger, says she never tires of hearing parents thank her for one more year of their child believing in Santa Claus. The newest attraction in North Pole is the Antler Academy of Flying & Reindeer Games, or just “Antler Academy” for short. 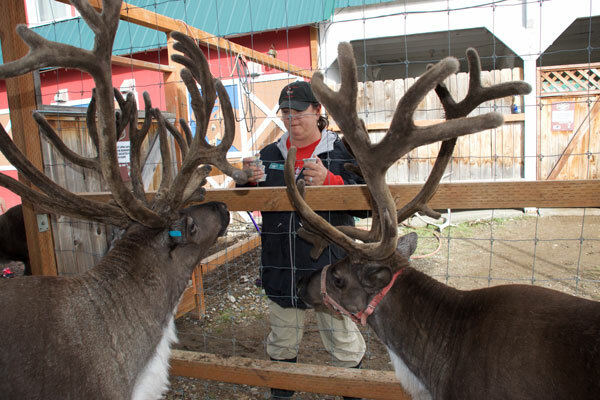 Located in the red barn next door to Santa Claus House, the Antler Academy offers visitors a chance to feed and interact with Santa’s reindeer (and yes, that means Prancer, Dancer, Comet, Vixen, etc.). Open to families, though group sizes and the number of children per group are limited for the safety of both the reindeer and visitors. Visitors are welcome to view the reindeer through the fence at any time of the year, at no cost, however, the “in the pen experience” with a tour guide is available during the summer season only, Memorial Day to Labor Day, for an admission fee. For more information, contact Santa Claus House, 1-800-588-4078 or www.santaclaushouse.com. Tour guide Rebecca Jones with cups of feed for the guests to feed to the reindeer. 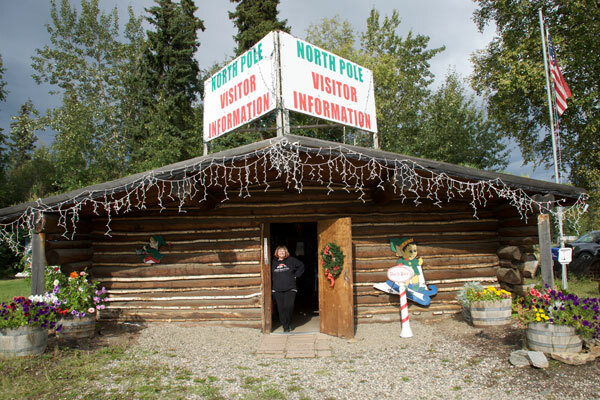 Most visitors to North Pole stop at the North Pole Visitor Information Cabin, operated by the local Chamber of Commerce, for directions and information. 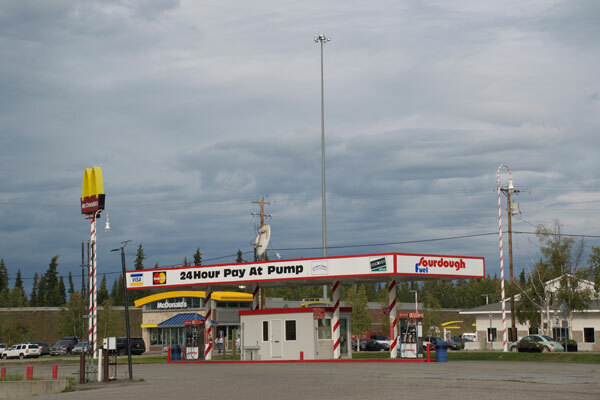 Located across the Richardson Highway from the Santa Claus House, at 2550 Mistletoe Drive, the center is open daily from Memorial Day to Labor Day; phone (907) 488-2242; email info@northpolechamber.us; website www.northpolechamber.us. Besides friendly traveler assistance, the visitor cabin has locally made arts and crafts, souvenirs, coffee/tea/cocoa, candy canes and area geocache locations. Radio station KJNP (King Jesus North Pole), operated by Calvary’s Northern Lights Mission, is located in North Pole. The station was started in October 1967, by the late Don and Gen Nelson, and broadcasts music and religious programs on 1170 AM and 100.3 FM radio and on TV Channel 4. The inspiration for the station came one Christmas when weather kept the couple from flying out to their ministry among rural villages. Instead, they broadcast their Christmas message from Fairbanks, and received such an overwhelming response that they started a regular program called “Far North Gospel Song and Hymn Time.” Visitors are welcome between 9 a.m. and 6 p.m. Monday–Friday. Large group tours may be arranged by calling (907) 488-2216. The missionary project includes a dozen hand-hewn, sod-roofed homes and other buildings constructed of spruce logs. With all this Christmas spirit, a tidy residential area with a wonderful new library, all the basic consumer services, and Fairbanks only 13 miles away for other needs, who wouldn’t want to visit (or live in) North Pole? 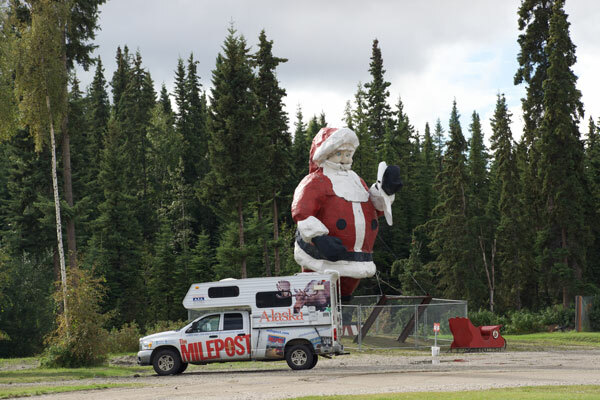 The MILEPOST truck at the giant Santa in North Pole.